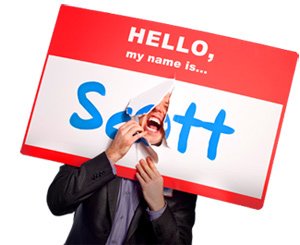 How to Live the Brand Without Annoying the Bejesus Out of Everyone You Meet - HELLO, my name is Scott! You never know when your brand will need to rise to the occasion. That’s why consistency is far better than rare moments of greatness. It’s not about dressing for success. It’s not about converting yourself into a corporate clone. It’s not about memorizing some hollow, hackneyed mission statement. 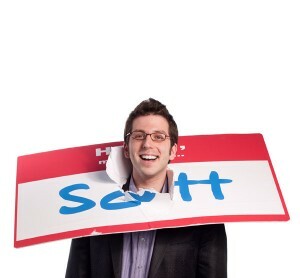 It’s not about puking your unique selling proposition all over everyone you meet. It’s not about integrating a sequence of promises that align with organizational initiatives. All that does is annoy the bejesus out of everybody you meet. HERE’S THE REALITY: To live the brand is to leave no doubt in people’s minds who you are, what you and why you are. It’s a glorious moment, albeit an unpredictable one. The tricky part is, in order to become the physical embodiment of your understanding – in order to truly live the brand – you have to be patient with yourself. Learning to live physically what you know intellectually doesn’t happen over night. Or over month. Or over year. But, when your life begins to enshrine what your lips proclaim, the world doesn’t just pay attention – it pays dividends. As long as you’re willing to hang in there. Is the message you’re preaching the dominant reality of your life? 2. Be disarmingly predictable. People trust brands that are predictable. Which means it’s your job to prove customers right. To confirm their suspicions about the value you deliver and the values you stand for. That’s all branding is anyway: An expectation. A shortcut. A predictable infection. And your challenge is to decide what you’re going to breathe into people – then sustain that spirit through every touchpoint. For example, I’m a Walgreen’s junkie. Always have been. Not because of their prices, which are usually high. And not because of their service, which is usually average. I pick Walgreen’s first because every store – across the country – sustains emotional predictability. I totally agree. And I know I’m not the only one. How predictable is your brand? Because every interaction you have with somebody either adds to – or subtracts from – the overall perception of your brand. What can customers expect about your behavior? 3. Polarize people purposely. The last thing you want is everybody to like your brand. For two reasons. First, you’re nobody until somebody hates you. At least that’s what my therapist says. Second, if everybody likes you – that means nobody loves you. And that’s a deadly combination. The secret is to practice strategic urination. To intentionally piss off the right people. After all, if you don’t risk turning anybody off with your brand, you’ll never turn anybody on with it. Take my friend Ellen. She never ceases to become annoyed whenever I mention my one of my books. Then again, she’s not even close to being my target reader. So who cares? I’m happy to piss her off any day of the week. And we’ve been good friends since college, so it’s cool. Ellen knows I’m just doing my job. That’s strategic urination. And keep in mind; you don’t want to polarize the people who matter most. Take the hospital by my house, for example. Every day when I pass by, I notice a cloud of smoke coming from the side door. That’s where stressed out nurses take their nicotine breaks. Unfortunately, it’s also where patients drive by every day. And those are not the people that hospital wants to polarize. For your organization, the challenge is to live the brand in a way that pleases the people who pay your bills and polarizes the people who don’t speak your language. Who did you piss off today? 4. To live is to let go. My grandfather, Frank, has been living the brand every day for thirty-seven years. As a result, his company, Closeouts With Class, has been a major player in the wholesale industry since the early seventies. That’s a helpful lesson for anyone in a leadership position: If you want your people to live the brand, allow them to do so through vehicle of their own uniqueness. Don’t worry – it’ll still be consistent with the core of the organization. You just have to trust that if you provide your people with a solid foundation, everything that grows from it will stay in alignment. How are you enlisting people to take the brand into their own hands? 5. Make the invisible inescapable. Let’s talk about your fans. The people who have an ongoing love affair with your brand. The reality is: They don’t care what you know – they only care how you think, and how your thinking will help them become better. The question you have to ask yourself is: How do you express how you think? The good news is, the available tools for doing so are both easy to access and easy to apply. From blogs to social media outlets to public visibility, your goal is to take what’s in your head and get it onto people’s radars, under people’s skin and into people’s hearts. Without that, your thoughts will remain just that: Thoughts. And all gorgeous gray matter will go to waste. And every branding effort thereafter will be nothing but winking in the dark. How are you thinking in three-dimensions? 6. Trust your genius to speak eloquently. Living the brand means never interrupting your work while it speaks for itself. Stepping on your own toes is a form of self-sabotage, and it’s costing your organization money. Daily. Instead, here’s my self-promotional suggestion: Take advantage of every opportunity to let your genius speak. Let nothing go unstamped by your personality. Don’t worry: You’re not bragging. You’re not showing off. And you’re not annoying the bejesus out of everyone you meet. It is possible to be in people’s faces without being on people’s nerves. You’re just living the brand by letting your truth speak in a remarkable way. The tricky part of letting your genius speak for itself is that it threatens average people. And they will try to degrade your brand into something less. You cannot let this happen. Life’s too short to surround yourself with people who don’t challenge and inspire you. Find new friends or find your brand forgotten. Are you a living brochure of your own awesomeness? *What habits do you need to jump out of to reinvent your brand? *Have you identified the truly distinct values that will fuel your future momentum? *How much self-reflection do you need to administer to scare yourself into the next version of yourself? That’s the upgrade formula: To return to your own experience inventory for answers. Because if you want your brand to be one constant rebeginning – one universe of continual transformation – you’ve got to participate regularly and responsibly in your own evolution. How will you upgrade your brand into ever more devastating weaponry? As you live your brand in all your unedited glory, you still have to beware of the potential downside: Terminal uniqueness. This is thinking you’re uniquely qualified, excessively entitled or self-righteously appointed to behave a certain way at the expense of others. That’s living the brand to the point that you end up killing it. If you truly want to live the brand: Be cool. Be smart. Be honest. Be you. And most of all: Be consistent. Because you never know when your brand will need to rise to the occasion. Do you have a brand or are you living the brand? For the list called, “26 Ways to Out Brand Your Competitors,” send an email to me, and you win the list for free!